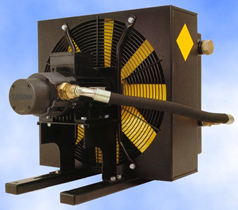 Hydrax supplies a complete range of oil coolers to dissipate between 4 kW and 50 kW. These high quality air blast coolers can be supplied as part of a Hydrax hydraulic package or as a complete retro-fit kit. Cooler kits are supplied with circulating pump, hoses to length, tank down pipes with fittings, thermostats, electrical control box, templates and full instructions for assembly and operation.